Silver Germander is an underused shrub that is as beautiful as it is tough And, while it grows nicely in normal garden situations, it is also extremely drought resistant. It can grow in blazing hot sun but is also happy in in partial shade. 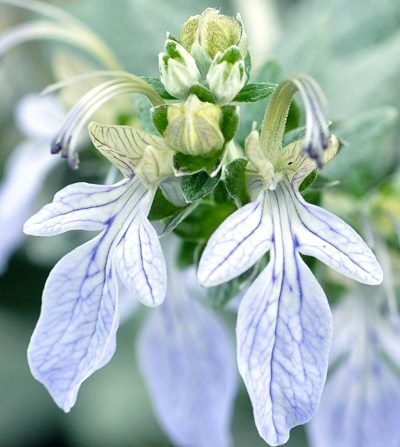 Silver Germander blooms in late spring and is covered in light blue veined flowers which are quite striking against the silvery leaves and branches. After blooming it puts out quite a bit of growth with each stem growing as much as a foot. When the growth slows down is the time to prune into a hedge or oval. Or, just let it go and enjoy the natural shape. It does not require pruning to stay healthy. Silver Germander makes a nice complement for bright green foliage plants like Yellow Lavender. This plant is often available in plug trays. These trays hold 128 of all the same plant. They are a great low cost way to fill a lot of space. Each cell is 3/4 of inch by an inch. Check here to see if Silver Germander Plug Trays are available.